Why are Chinese judges so stressed? The photo above was viral in legal Wechat groups in early February–a notice in the lobby of a Guangxi district court advising litigants to use mediation or arbitration because the judges in the court are overworked, overstressed, and voting with their feet to leave the courts. The notice gives the court’s 2017 caseload (36,476 cases) and prediction for 2018 (over 40,000) and says fifteen percent of the judges have quit, retired, or transferred out of the courts and judges’ assistants are leaving as well. How many Chinese judges are there? SPC President Zhou Qiang reported to the National People’s Congress Standing Committee in November 2017 that there were 120,128 quota judges/judicial post judges(员额制), a reduction from 211,990. Some of those judges have become judicial assistants, while others have been transferred to administrative roles within the courts. It appears that the authorities decided to reduce the headcount of Chinese judges by comparing the percentage of judges in China with those in major jurisdictions. The readers of this blog know (and Chinese judicial reformers know clearly), the structure of the Chinese courts is quite different from those in other jurisdictions, whether civil or common law systems. However, once the reduction had been approved by the highest political authorities, those questioning the wisdom of this decision run the risk of improperly discussing (or distorting (歪曲)) judicial reform (妄议司改), a variation of “improperly discussing Central policy (妄议中央). Chinese courts are a cross between a court and a Party/government organ, with personnel in administrative offices such as the political department (政治部), general office (办公厅), supervision bureau (监察局). Senior personnel such as the court president, vice presidents, and division chiefs, have a significant portion of their time taken up by administrative matters. The judicial reforms now require senior personnel to hear a small number of cases per year and according to President Zhou Qiang, that number is up 32% (the base number is unknown). Of the 120,990 judges who have the status of judge, 85% of them hear some number of cases. Statistics on the number of judges actually hearing cases are hard to pin down. We do not know how many judges have left the Chinese courts in 2017 or 2016 by quitting or transferring to a government department. 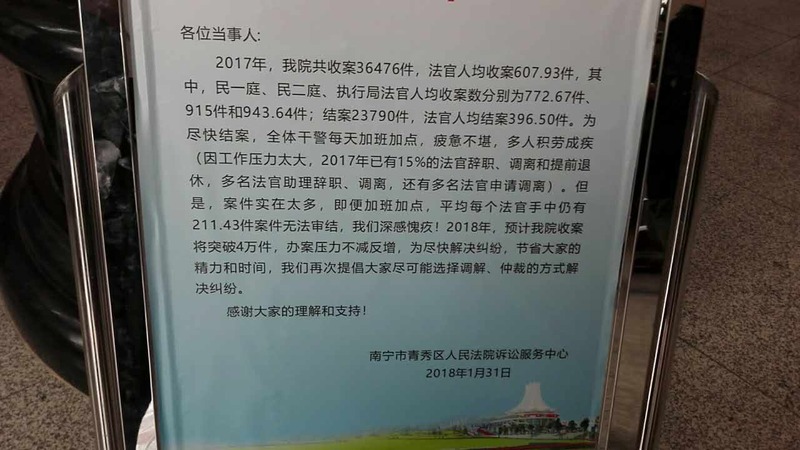 Presumably, the head of the Supreme People’s Court’s (SPC) Political Department (in charge of personnel) does, but those statistics seem to be confidential. Based on partial information however, judges are continuing to leave the courts, from the SPC on down. From a survey done by a post-doctoral student at the China Institute of Applied Jurisprudence of the SPC in 2015 (further detailed below), close monitoring of Wechat articles, and my own personal observations, those who remain in the judiciary have a high degree of stress. In the spring of 2015, then Beijing Higher People’s Court Judge Hu Changming and a post doctoral student at the SPC’s China Institute of Applied Jurisprudence, but now a researcher at the Chinese Academy of Social Sciences Institute of Law, conducted a job satisfaction survey among Chinese judges, published in the prestigious China Law Review and summarized in SPC media. Hu previously won awards for his writings as a judge. He later published an article on Wechat (originally published in the defunct Wechat account “Home of Judges” that (according to this report) led to his punishment for distorting (歪曲) judicial reform. Hu received 2660 responses from judges working in all four levels of the Chinese judiciary. Although the ongoing trope about the Chinese judiciary outside of China is that most Chinese judges are former People’s Liberation Army officers, Judge Hu’s survey found that most judges had at least an LLB or master’s degree in law, with small numbers of judges with less than an LLB or a Ph.D. 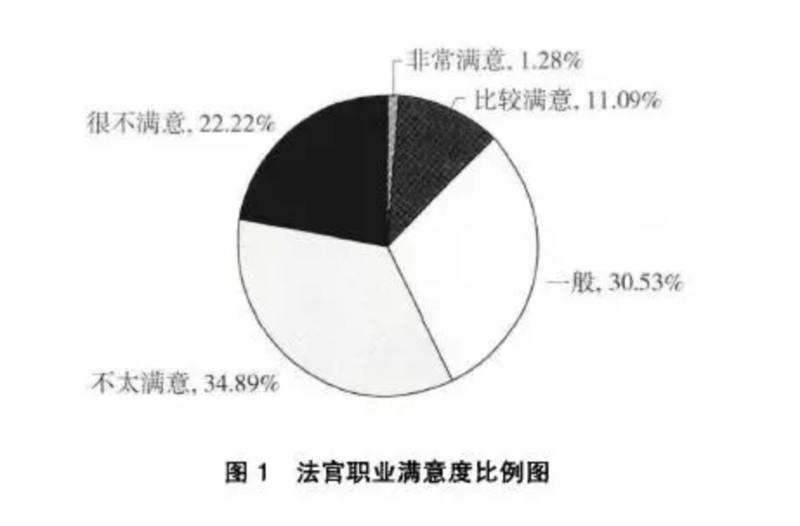 The pie chart below （from Hu’s study) is of responses concerning job satisfaction (extremely satisfied 1.28%, relatively satisfied, 11.09%, neutral, 30.53%, not very satisfied 34.89, and very dissatisfied, 22.22%). His survey further revealed that practically all (94.47%) of judges surveyed had considered quitting the judiciary, of whom 57.37% had considered it seriously, and only 5.53% had never considered it. His survey had more male than female respondents, and more middle-aged than late career judges, likely affecting these results. Why are Chinese judges dissatisfied? According to Hu’s 2015 survey, Chinese judges are dissatisfied for both work-related and benefits-related reasons. This is consistent with my earlier research. This post will look at some of the work-related reasons. The caseload in the busiest courts is large and on the increase yearly（see the chart below for the caseload in first half of 2017 and percentage increases). The Wechatosphere frequently reports on the heavy caseload in the country’s major courts and the stress on frontline judges. In September, 2017, I reported on the situation for frontline judges pre-19th Party Congress. For domestic cases, judges are under tight deadlines and their work computers will flash a red signal when a case isn’t closed on time. Although unreasonable performance targets were to have been abolished, Wechat articles and judges who I was able to disturb at year’s end mentioned that they were under pressure to close cases by year end so that their court could achieve a high closing rate, documenting the closing rate pressure mentioned in September, 2017. Another source of pressure for judges is the lifetime responsibility system, which two Chinese judges writing in an academic law journal called the “sword of Damocles hanging over judges” ( 法官办案责任追究是时刻悬挂在法官们头上的“达摩克利斯之剑”), analyzing the drawbacks with the standards and their implications for judges. Hu’s survey found that almost half of them felt that the responsibility system for mistaken cases was unfair and this is also shown in Wechat and articles in court media as well as comments by individual judges. According to Judge Hu’s survey, judges regularly work overtime, some for over six months a year, and most mention that they have inadequate administrative support. This may change over time as some law graduates are willing to take on positions as judge’s assistants, but as the sign above indicates, some of them are leaving too, but from the Wechatosphere, they feel stressed as well. As mentioned in this earlier blogpost, interns are a welcome source of additional brainpower, although in experience of my students, at least, interns need to depend on their parents or school scholarships to cover their expenses during their internships. Additionally, meetings of various types take up their time as well. Since the Communist Party has been focusing on raising the ideological level of the judiciary, it seems likely that for frontline judges, meetings focused on the latest Party documents take time away from cases. As this blog has mentioned previously, the judicial reforms for the most part have retained the pyramid structure of Chinese courts, where the court president, vice presidents, and division chiefs have administrative authority over judges. And even for those reformed courts that have a flat administrative structure, the authority of the head of the court (or tribunal and the judicial committee still remains in place, although the judicial reforms call for new committees to be put in place relating to both appointments and judicial punishment. Will the “deepened reform of the judicial system with comprehensive integrated reforms” (深化司法体制改革综合配套改革) (discussed in December’s blogpost) deal with the stress of China’s judges and retain (and attract) the elite corps that Chinese judicial reformers envision? We will need to wait and see.